Last October, Lady Gaga debuted her pink sapphire engagement ring. In February, Katy Perry announced her engagement to Orlando Bloom on Instagram, unveiling a similarly unconventional ring which features a vivid pink or red center stone, reportedly a pink diamond or a ruby. 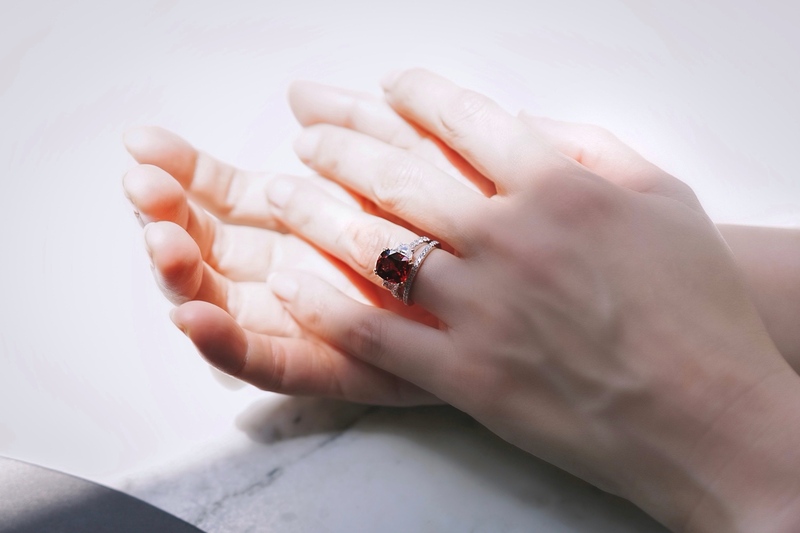 When not one but two of the most famous and stylish women in the world sport engagement rings less ordinary, you can be certain of the return of a big trend — the coloured gemstone as the heart of an engagement ring. We have seen this before: Remember the global obsession over Kate Middleton’s sapphire ring? Diamonds may be a girl’s best friend. But it is coloured gemstones that seem to have captured the hearts of the royals. 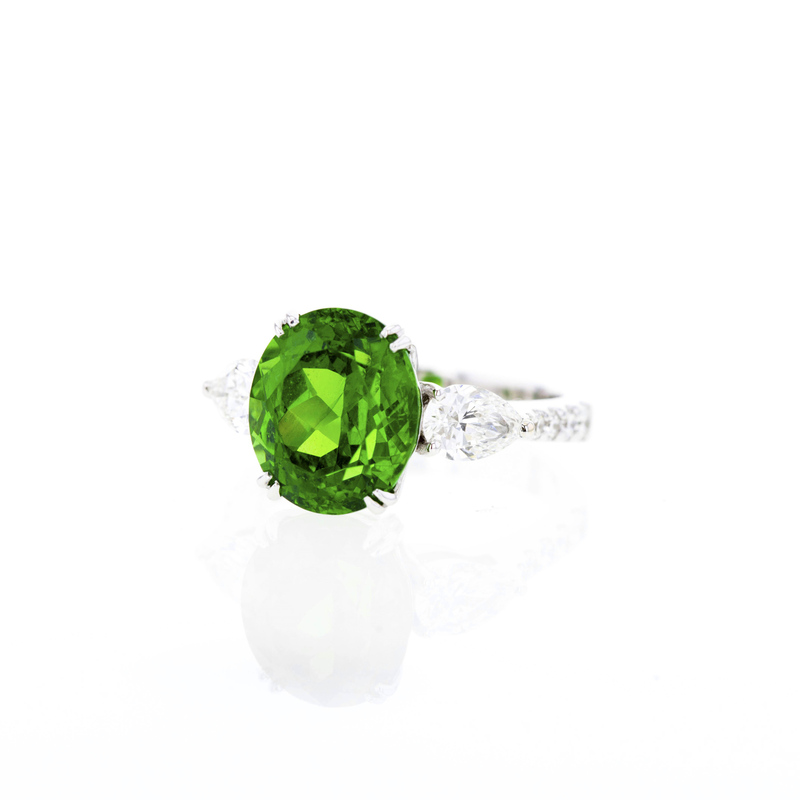 Fun fact: The Tsavorite is a marketing moniker given to an emerald-green variety of the grossular garnet. Like a celebrity’s stage name that is more memorable or marketable (like Katy Perry or Emma Stone), the name Tsavorite was proposed by Henry Platt, the president of Tiffany & Co, when the gem was first discovered in East Africa in 1967, inspired by the Tsavo National Park in Kenya. 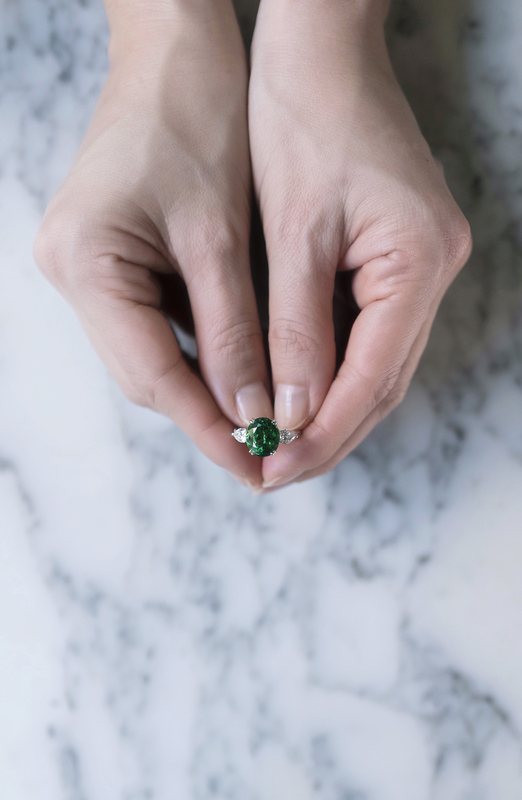 In case you are considering going green for your proposal, here are a few basic things you ought to know about this garnet: Tsavorite has become one of the most popular and expensive garnets due to its rarity combined with effective marketing strategies. Large tsavorites are extremely rare, in fact more so than large emeralds. It is more brilliant because of a higher refractive index and more durable compared to emeralds. Where virtually all emeralds are treated with oils or resins to fill internal fractures, tsavorite is always untreated. When you’re shopping for a tsavorite ring, what you should look out for is an intense vibrant green colour in the stone. Like emeralds, tsavorites can be bluish-green or yellowish-green. Avoid anything that resembles a peridot, which is more yellowish-green, or stones that are dark with a greenish-black hue. Inspired by Lady Gaga’s pretty bling in pink? Well, acquaint yourself before you make a decision. Did you know that while sapphires are commonly thought of as blue, they occur naturally in a variety of colours including pink, ranging from light to dark pink? They belong to the corundum family of minerals, and contain traces of iron, titanium, magnesium, copper and chromium which help determine its colour. The higher the chromium content, the more vivid the pink. Before the 1990s, when the Madagascar mines — the leading producer of the stone — pink sapphires were considered to be incredibly rare. The quality and quantity of pink sapphires from Madagascar are what make them more widely available, affordable and popular. 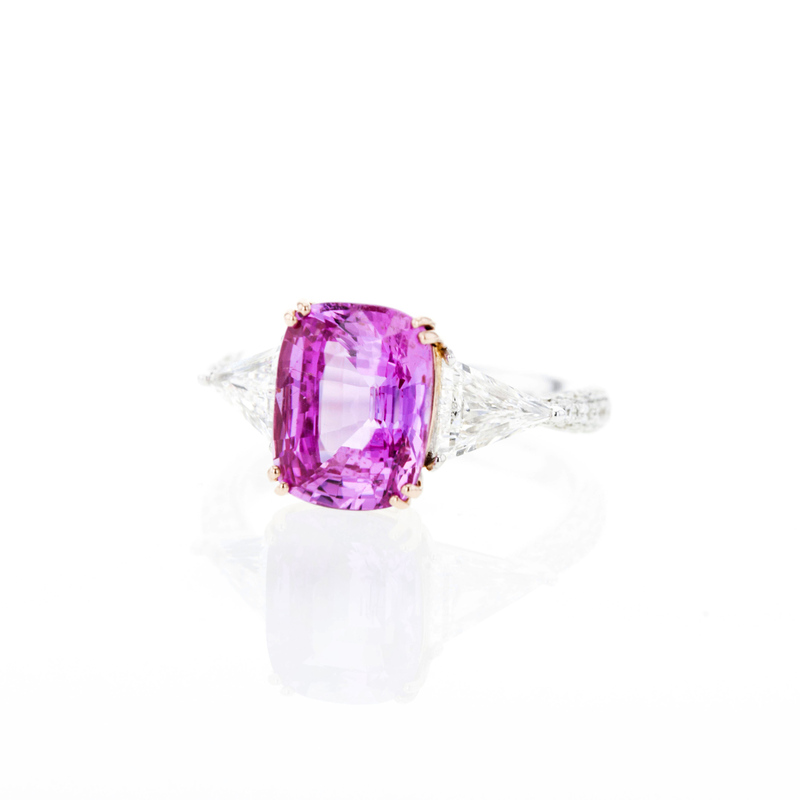 In many cultures, people believe pink sapphires symbolise trust, loyalty and sincerity. They’re also believed to carry good fortune and intense love, which make them pretty perfect as the emblem of your matrimony. 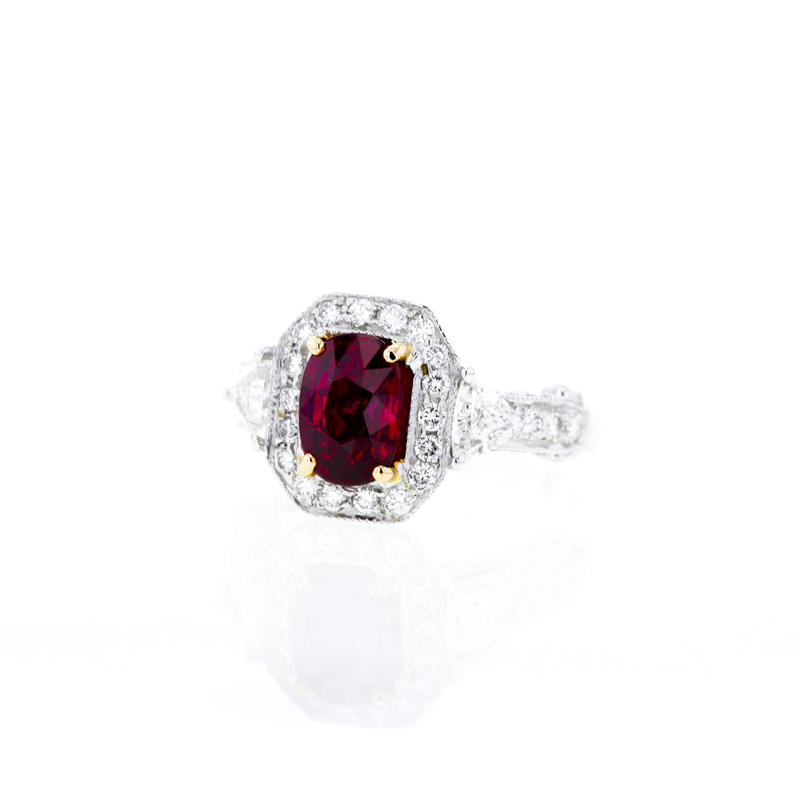 “Ruby” comes from the Latin word rubens, which means red. But if you ask us, we prefer what it’s known as in Sanskrit: Ratnaraj, which means the king of gems. This fiery stone symbolises power and protection. When worn as a talisman, ruby was historically believed to help protect warriors in battle. In fiction, it protected Dorothy in the form of ruby slippers. But we have a feeling the main source of inspiration is really Katy Perry or Eva Longoria whose left ring finger is radiant in ruby. Almost all rubies have flaws. Those without imperfections are exceptionally rare and command prices even higher than diamonds of a similar weight and quality. 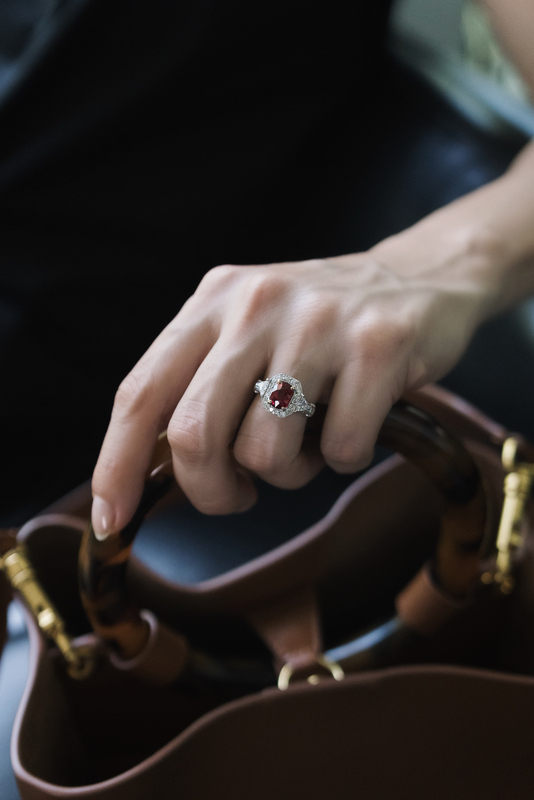 If you’re a July baby, that would also make the ruby your birthstone — double the celebration. 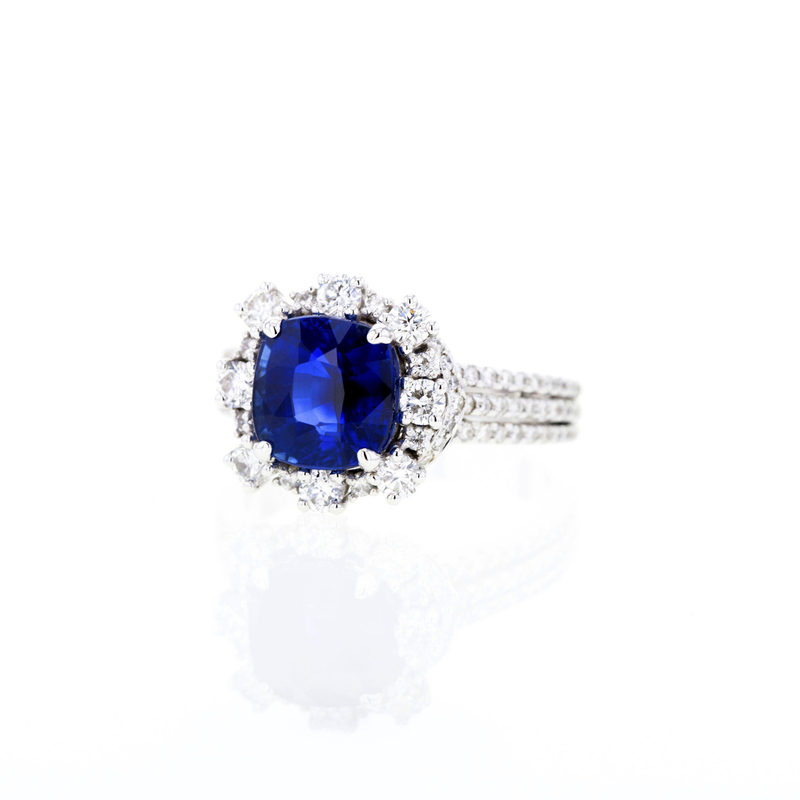 Thanks to Kate Middleton and Princess Diana, the blue sapphire is perhaps the most requested and common coloured gemstone for an engagement ring. Royalty of the Hollywood ilk — think Elizabeth Hurley and Penelope Cruz — it seems, is also quite fond of the blue beauty. It’s little wonder. Deep-blue sapphires have long been associated with royalty. Sapphires were often worn by medieval kings, who believed that the gemstones could protect them from their enemies and from evil. Throughout history, various cultures have attributed mystical powers to sapphires, which are also thought to symbolise nobility and faithfulness. The romance of the sapphire goes as far back as 1796, in fact, when French Emperor Napoleon Bonaparte gave to his beloved Josephine a sapphire engagement ring. If it’s durability you’re also after, you’ll be pleased to know that they are rated nine out of 10 on their ability to withstand scratching based on a system called the Mohs Scale of Hardness. The only natural item that can scratch a sapphire is a diamond. 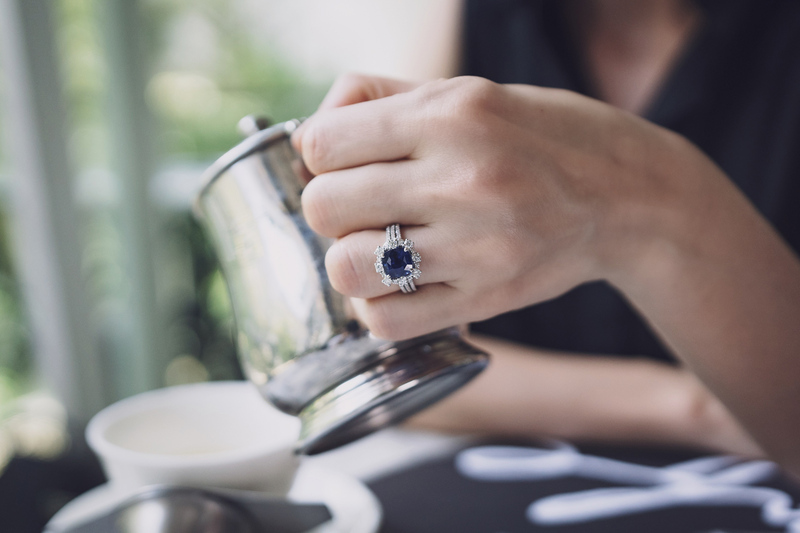 This could be the not-so-romantic reason why blue sapphires make a good choice for engagement rings, especially if you plan on wearing it every day. Spinel bears an uncanny resemblance to rubies. In fact, the two stones are so similar in appearance that there was no distinction made between them until the late 19th century. 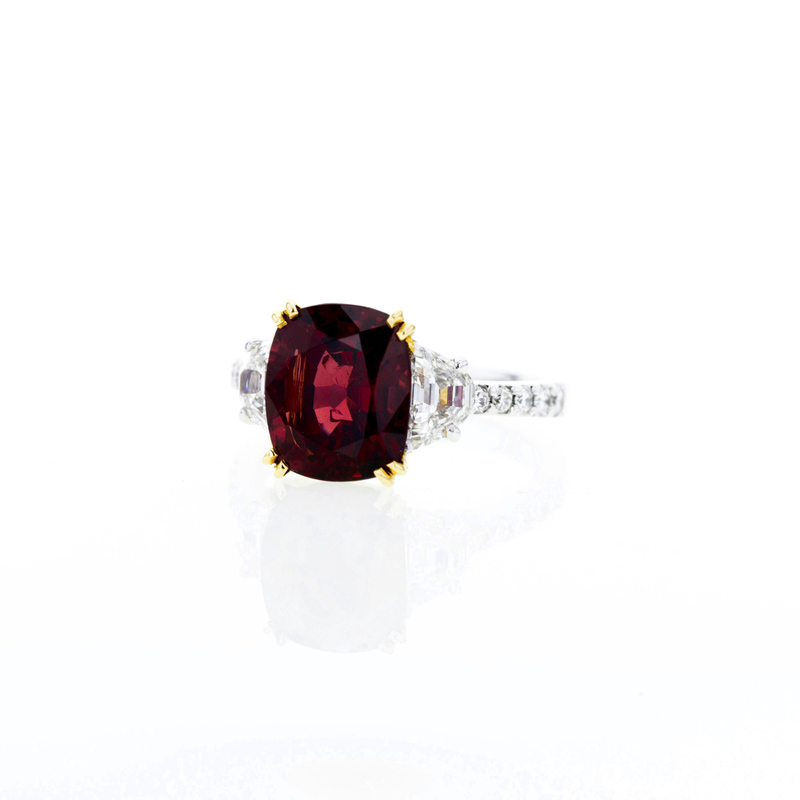 Many famous old “rubies” were later discovered to be in fact spinel. The enormous “ruby” that forms the centrepiece of the royal crown of England (the Black Prince’s Ruby), for example, was actually determined to be spinel. This gemstone, which can be commonly found in Sri Lanka, Myanmar, Afghanistan, Vietnam, Brazil, Pakistan, Russia, Turkey, Italy, Sweden and Madagascar, is colourless in its pure state. Its impurities are what’s responsible for its variety of colours, the most valuable and desirable of which is a deep blood red. 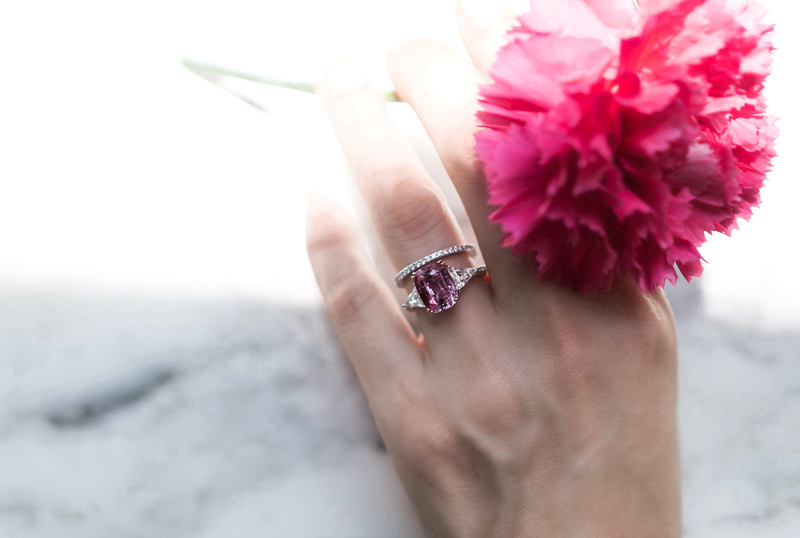 What makes the spinel a suitable stone for an engagement ring is the belief that it is a stone that brings inspiration and hope. Like the citrine, it helps to release stress and replenish love energy levels. So, which is your gemstone of choice?